SightPhonics helps adults and teenagers to independently learn from home and read over 500 adult words like "catalog" and "hospital" with just the FIRST reading book. 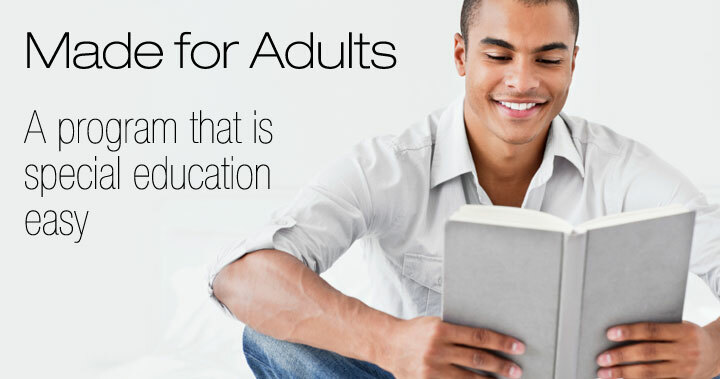 SightPhonics is called "the adult reading program that surprised even us" because the reading program was originally created for use in a private school situation, but by a sheer stroke of fate, was tested on adult students and surpassed all other adult literacy programs available. 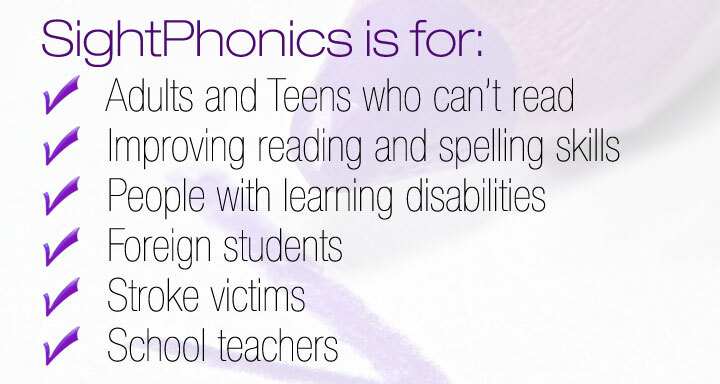 Sight Phonics is also the only adult reading program that teaches adults the fundamentals of how to read at home in an effort to greatly improve their reading skills and reading fluency. SightPhonics includes stories, words and sentences for practice. All the reading phonics lessons in SightPhonics are available in audio recordings on CD. Just put the CD in a standard CD player, open the book and follow the directions.
" 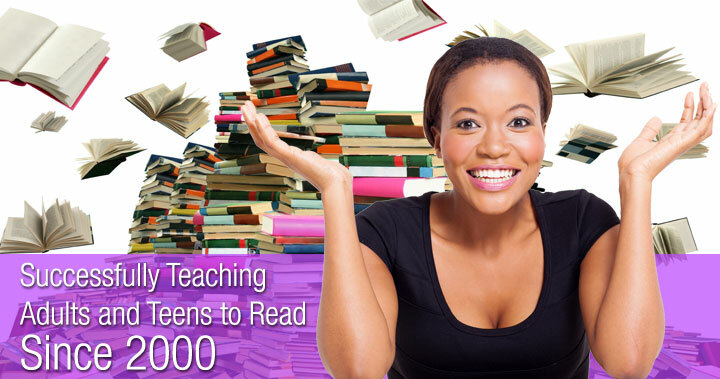 This is a new and unique adult phonics reading program, unlike any other reading programs I have used. The best part is that it really works! My students have found it easy to use ... without a teacher's help. I highly recommend it. " 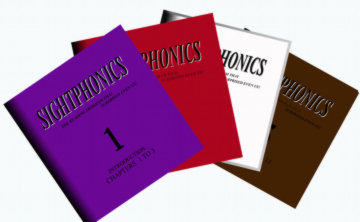 SightPhonics products are also available online using the same fast and easy methods as the CD version in alternative online reading software for adults. SightPhonics works by breaking down the word and then reads it to you. 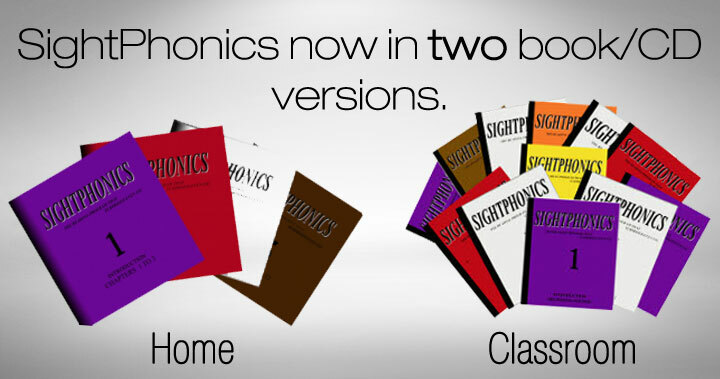 Simply click the order button and you can use SightPhonics for as long as you like. When you feel you no longer need SightPhonics just cancel your subscription any time through your PayPal account. But please...send us your success story. We love to read them. As is typically the case when approaching this subject, SightPhonics guided, beginner adult reading lesson plan starts by teaching the letter sounds and the letter names. The online version teaches by reading the instructions, sounds, and words when they are clicked along with the feature of breaking down a word by rolling the mouse over it. From there the program moves on to teach how to blend the sounds to make a word. SightPhonics uses a method that has not been used in the current school system for many years. It teaches consonant-vowel blends, such as "ca" at the beginning of the word "cat". The program then shows the end sounds that make a complete consonant-vowel-consonant word: "cat" (differing from the way many programs that teach these blends as c + at). ). This method of teaching, using the first two sounds as one sound blend, was typically used in programs during the 1940s before the schools changed to teaching sight words. With the method of using sound sets the learner can read smaller words like "cat" and "hat" or larger words like "hospital" and "medical" and sentences like "The catalog did not fit in the box" after completing only the first lesson book, making SightPhonics a program truly for adults. SightPhonics was researched by computer to teach the most words in the least amount of time providing an opportunity for those who have little time and energy to learn to read and write.
" I bought this program for my 27 years old son. He went through it so fast and was so excited. This program needs to be in the schools. He struggled for so long and resisted learning out of fear for a long time. We are on Book 10 and he is reading things he never thought possible. I love this program. " The subsequent books teach ending sounds to blend with the previously learned sound sets, Dolch words (the most commonly used words in reading) and some sight words. Following that, consonant blends in the beginning of a word like "bl" and "cr" are taught. Then the silent "e" at the end of the word rule introduces the use of sound families (three letters together to make one sound). such as "ite" allowing the learner to read words like "parasite". Specific diphthongs are taught after that. Diphthongs are two vowels that make one sound such as "ai" or "oa". Letter sets where the vowels like "aw" and "au" make different sounds are taught in the next book. The last book is the Brown Book - certainly the most valuable reading book in the collection. When the learner has reached the Brown Book, a tremendous amount of success has all ready been obtained. The difficult and ridiculous fundamentals of reading English are all condensed into this book. Sight Phonics purposely left the confusing things at the end of the program. Things like the soundless "k" in front of the word "knife", and "tion" and "sion" sound families making the same "shun" sound are all taught last after the learner has experienced much success at reading comprehension and has become as functionally literate as possible.
" I love your program. I had to let you know that. I am 57 years old and have been faking reading all my life. I am so happy to really be able to read things like menus with my grandkids. " With all of these elements being taught in the last book of the series, the student has made tremendous steps towards expanding their fundamental education level by reading at an adult level prior to being introduced to the last book. Mastering the lessons in the last book will raise their literacy to that of a fluent and proficient adult reader. Quit saying, "I can't read," and instead say, "I want to teach myself to read." And the answer isn't spending a lot of money on a reading improvement school or adult reading tutor. Learning the teacherless SightPhonics way to teach yourself to read or teaching adults to read naturally was never made easier. For people with special circumstances such as exchange students, students outside of the United States learning a second language (ESL learners), special education or some severely mentally handicapped students(e.g. down syndrome), individuals interested in accent reduction, illiterate adults with the dyslexia disability or other learning disabilities, or those who have no teacher available to assist them, SightPhonics is a simple, total self-teaching experience designed specifically for the purpose of independent learning in the comfort of your own home with home use teaching materials.
" I thought I was stupid but I knew I wasn't. My husband bought this program for me on my birthday just before Christmas. I was so happy to be able to read for the first time that I told him I didn't want anything for Christmas then I changed my mind and asked for a treadmill so I could be skinny when I went to college. " We often get calls concerning the ability of SightPhonics to teach spelling. Though reading was and is our main focus, we have found that success in spelling increased dramatically in our learners. Spelling in the school system requires writing the word multiple times which is useless without knowing why the particular letters make a particular sound. SightPhonics gives the sound and all the words that go with that sound in a progression so one sound set can build on another. Following the proper progression the learner "sees" the sound set that needs to be learned for those words and immediately the learner recognizes it for both reading and spelling. This is why we spelling became an added bonus for those who were learning to read. Feedback concerning spelling came in from the beginning from those who used SightPhonics to learn reading. As we got testimonies of victories in spelling, we realized that success in spelling would make sense. The rules for spelling are the same as the rules for reading, though we did not intend to teach spelling, so we knew that teaching reading would also teach spelling. What we didn't expect was to surpass the current programs used to teach spelling. It is the unique method used in SightPhonics that brings so much success in reading and it only makes sense that that same method would bring victories in spelling as well. Related: teach me to read remedial phonemic awareness with home use teaching material, grammar, grammer. Memorize sound complex sentences sounding out word families with color coded stroke and reading activity using reading comprehension worksheets and online reading book that is teaching reading. © 2000-2017, SightPhonics. All trademarks are property of SightPhonics.